Although staff may read and write English on a daily basis, it is through speaking and listening that pronunciation and fluency really develop. As with any skill, it is only through applied practice that proficiency becomes available on demand. In-house company language training is a cost-effective way of maintaining and developing professional communication skills. The top firms in Finland regularly hold such training for their management and staff. Participants typically meet for 1.5 hour sessions on a weekly basis or as part of an intensive course. Under my guidance, students are actively encouraged to practise new vocabulary by taking part in controlled discussions surrounding the latest developments within their professional fields and talking about the important news topics of the day. If requested, cross cultural aspects can also be brought into the curriculum. The training is given either on a one to one basis or in a small group. The maximum group size is never more than 10 to allow everyone to have an active role in the training session. 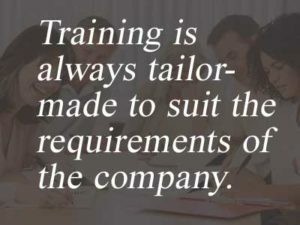 Training is always tailor-made to suit the requirements of the company. If you would like to know more about the training opportunities available for your company, do not hesitate to contact me. Each year, a limited number of open courses are run for smaller companies to participate. Please ask about the latest courses in your area. Ask about the training opportunities available for your company or language courses in your area!